Prince George, B.C. – With nearly 8400 evacuees in Prince George, the Royal Bank has set up a mobile bank to assist them with their financial needs. 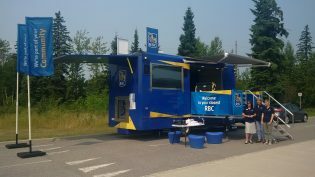 The pop up bank has been set up near the evacuation centre at the College of New Caledonia. The mobile unit provides can handle public Wi-Fi, an ATM, and charging stations. Evacuees can access banking support, receive financial advice, and learn more about digital banking options. RBC also announced a $50,000 donation to the Canadian Red Cross in support of Canadians affected by damages and displacement caused by the wildfires in B.C.’s interior. Donations are being accepted at all RBC branches across Canada to support the Canadian Red Cross BC Fires Appeal.